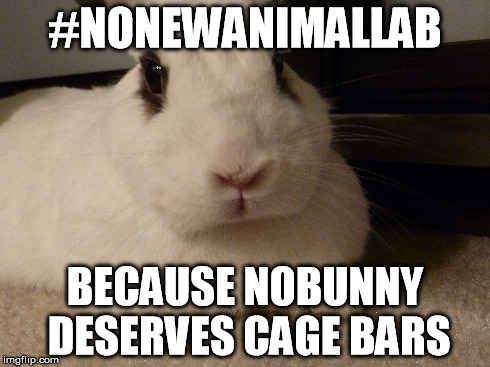 Show your support and join the #NoNewAnimalLab photo campaign from Saturday, April 18- Sunday, April 26, 2015. The time is now for us to increase our public pressure on Skanska to drop their contract to build a new animal lab at the University of Washington. Skanska is the construction company that the University of Washington is using to build this new animal research lab. They’ve caved in response to public pressure on controversial projects before, so we’re hoping to keep up the pressure to let them know that the public looks down on them for agreeing to build this lab. Science has progressed beyond animal research models, and so should the University of Washington. Download the template and print our photo campaign sheet. Write in your reason for opposing the new animal lab and take a picture of yourself holding the sign.